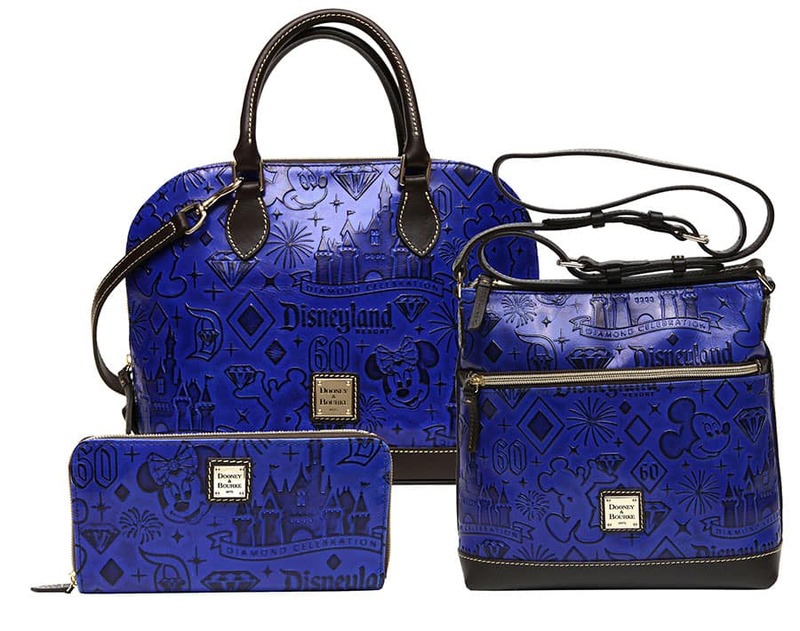 Disney fans, I know you have been waiting patiently to get a sneak peek of the Disneyland Resort Diamond Celebration collection from Dooney & Bourke ever since we gave you a first look at all of the merchandise headed your way. Not only am I able to share the collection, debuting this May at the Disneyland Resort, but I also have your first look at what you can expect this July. As you can see, the design for the May collection features an all-over pattern depicting classic attractions, icons and characters. I didn’t think it could get any better, but the teams added an extra touch of magic with tan leather accent trim and handles. While many of the silhouettes will be in limited supply, keep an eye out for varying styles such as a wristlet ($88), letter carrier ($178), satchel ($248) and shopper tote ($268). If that wasn’t exciting enough, debuting in July 2015 will be an embossed leather collection. Take a look! I love the detail that appears on the bag – for example, the diamond shapes that make up Minnie Mouse’s bow. Silhouette styles will include a wallet ($228), cross-body ($248) and zip satchel ($268). Which collection has made your list? Any idea as to how long these will be available. I will be going the first week of september for marathon weekend and would love to buy one. Do you happen to know when in July these will be released?? Thanks! It is July. Do we know if the embossed blue leather collection has been debuted yet? If not, when exactly this month? We are making our way there now and are scheduled to be in the most magical place July 18 – 21. So where exactly in Disneyland will these be sold? I had a friend looking all over the other day for the 1st released set and could find them anywhere in the park or in Downtown Disney District’s stores. 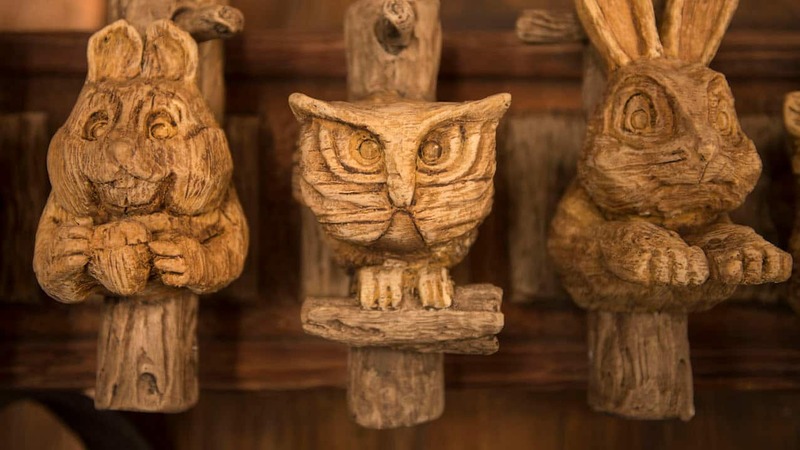 Eileen, they can be found at Disney Vault 28 in the Downtown Disney District. Does anyone know when the ROYAL BLUE bags are going to be released? I know it’s in July 2015 ,but what date?????? Hi Nikki! If you have the chance stop by Disney Vault 28 in the Downtown Disney District. The bags released today. I was just recently at the parks and was asking around trying to figure out the exact release date for these and no one seemed to have the exact answer. For the ones being released this month, do you have an exact date? I will be driving in from out of state specifically for this and cannot afford to come and them not be thee…. Will it be may 20 or the 22?? Hey Brianna, I’m not sure if you ever found the bags you’re looking for. In case you’re interested, the new collection debuted at Disney Vault 28 today. Does the May satchel come with straps or just the handles shown? I too, will turn 60 this year. And since I love my Dooney bags I have my eye on the blue and white collection! Laurie, I think that’s an excellent choice! Is the closure for the satchel a snap or a zipper? Kayla, I believe it’s a zipper. Which purse is the satchel vs the shopper tote? Is the satchel in the foreground or the very back of the picture? I am referring to the May releases. Roxann, the shopper tote is in the middle in the back. These are beautiful! Do you happen to know where in the park I can find one? This is my family’s first visit to Disneyland in June and I hope to find one! Thank you! Susan, what a wonderful time to make your first trip to Disneyland! Various locations will carry the collection based on availability. Definitely stop by Disney Vault 28 in the Downtown Disney District or even Disney Clothiers in Disneyland park during your visit. Any news on Harveys bags? I’ve seen some odd things online so far and I’m curious if they are just rumors. Desirae, keep watching the Disney Parks Blog. We’ll be featuring them soon. I sure am hoping that these are still available May 29-June 2, as that is when we will be there!!! I’ve always wanted to buy one when I’m there but just never did, I sure am glad that I waited, because these by far are my favorite. Andrea, definitely check when you get here. As you can see, they are extremely popular. For whatever reason that we would be out when you visit, I would definitely consider inquiring with Merchandise Guest Services after your trip. Hi Nedra! The event was open to everyone, not just Passholders. 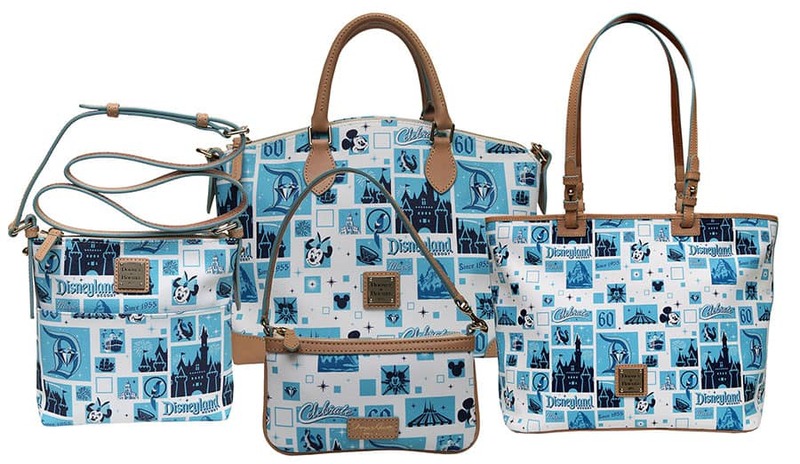 The bags, based on availability will also be available in the parks and at locations like Disney Vault 28. Taelene, you should have received an e-mail about it as a registered event guest. I hope you got it. Are any of these Dooney and Bourke collections/items limited edition, or will items be able to be reordered so they can be available throughout the entire Diamond Celebration? Also, will you let us know when you have a more specific time frame for when the July collection will come out? Thanks. Lauren, a limited number of units will be available however we do anticipate continuing to re-order during the celebration time frame. I will certainly keep you posted as I find out more on the timing for the July collection, etc. I can’t wait. I knew a few months back that there would be a new release for the 60th. But I had no idea there would be two designs to choose from….so many wonderful choices, I’ll just have to get one of each design. I love my Disney D & B’s and they get a lot of use. Hoping there’s a Weekender with the May release. Love the designs, but prefer a different style such as a backpack and crossbody bucket. Is the shopper tote a zip top or snap closure? Hi Amy, it’s actually a zipper. These event-specific Dooneys just keep getting better and better! Will any of them be available online DisneyStore? They are not planned to be released online but if that should change, I will certainly update my reply to you. Ooohhh…love them all ! For those of us not lucky enough to have a Disneyland trip planned for this year, will these be offered on-line ? Hi Lori! As of right now, unfortunately the answer is no. However, I would inquire with Disney Merchandise Guest Services in late May/early June or if you are partial to the other collection, sometime in July, to ask about availability and potentially ordering it. Will the bags in May be released at the 24 hour event or before? I just have to get the shopper tote for my collection. The design team really out did themselves this year. Hi Samantha! I’m so glad that you like them! I know the teams are still determining the release schedule. I would venture to say if it’s not on May 22, it will certainly be close to that date. Hi Katherine. They are actually coated canvas. Do you think the first one might be available for the merchandise preview on May 20 & 21? Hi Taelene! If you are attending the event, keep an eye out for an e-mail as event attendees will have the opportunity to advance purchase the May collection. I will be spending my 60th at WDW this year. I would love to be able to get one of these Dooneys, will they be available online? Hi Catherine! Availability of the bags will mostly be in park and/or possibly Disney Merchandise Guest Services at a later date, which we are still trying to confirm. I’ll try to keep you updated. Will these beautiful bags be available to purchase online? Hi Karen! As of right now, they will only be offered at the Disneyland Resort and potentially via Disney Merchandise Guest Services at a later date. Hi Michelle! Any chance the Dooney & Bourke will be added to the Diamond Celebration Event, either the RSP or the preorder in the DLR60th store? It’s very disappointing that these were not included, as many are no doubt going to the event to purchase these. Thanks! Hi Amy! If you are attending the event, I would keep an eye out for a special e-mail from the events team, as you will have the opportunity to advance purchase the May – Diamond Celebration collection. BEAUTIFUL!!! Love the blue and the patterns! Will these style or pattern be available online or only at Disneyland! Hi Linda! As of right now yes, it will only be available at the Disneyland Resort. If that should change I will certainly update my response to you. I LOVE these!! It would be great to see the May print in a bucket tote or Kristen! Each time a new Dooney & Bourke collection comes out I say it’s my favorite but well, the Diamond Celebration collection takes the cake! I’m so glad you like them Julie! We are pretty excited about them too. Please, please, please, tell the merchandise people that this needs to be released in a bucket tote or a Kristen. I have too many Disney Dooney satchels! I’ll definitely pass it on Dawn. Thanks Michelle. I love the Collection that will debut in May. It’s beautiful. Will it debut May 22nd? Hi Lori. Most likely around that date. Unfortunately there is not an official date of release as of yet. I would even gather to say, maybe on or around that date.